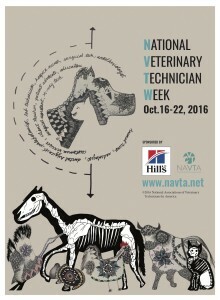 National Veterinary Technician Week celebrates those very important people in our lives called veterinary technicians. Though veterinary technicians play a vital role in veterinary medicine, many people don’t realize the scope of their field. To put it in human terms, veterinary technicians are the veterinary equivalent of nurses. The work they do is crucial to the health of our pets, the well-being of pet-owners, and the day-to-day function of veterinary clinics and hospitals. Throughout National Veterinary Technician Week we will feature real veterinary technicians working at the Cummings Veterinary Medical Center. 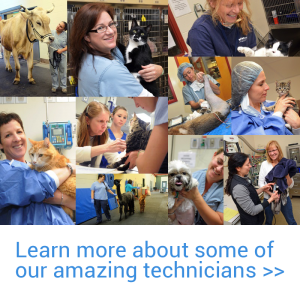 Be sure to celebrate the veterinary technicians in your life by saying thank you! 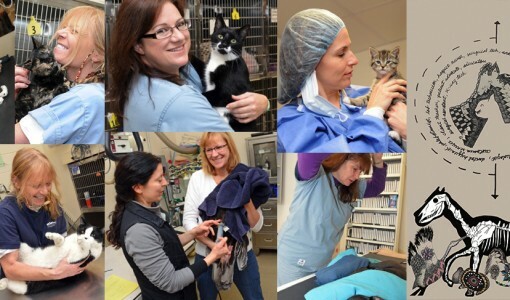 Read about our featured veterinary technicians throughout the week! Veterinary Technicians: A veterinary technician is a skilled veterinary medical professional who has either graduated from an accredited 2-year program, or has achieved qualification through on-the-job training. Vet techs perform a great number of tasks from animal care, to veterinary and client support. Certified Veterinary Technicians (CVTs): CVTs are individuals who have either graduated from an accredited CVT program (generally a 4-year-course), or have met the minimum requirements to become qualified as a CVT. The tasks CVTs perform are many, and may range from handling and examining animals, to providing anesthesiology support, to assisting in surgery, and beyond. Veterinary Technician Specialists (VTSs): VTSs are CVTs who have specialized in a particular area of veterinary medicine, and have been recognized for their expertise within that discipline.